The Western Cape is easily South Africa’s go-to destination when it comes to culinary and alcoholic delights. The wine route is dotted with beautifully kept vineyards that leave you ogling at their elaborately-named façades and luscious grape vines. Safe to say your choice is hardly limited. Stellenbosch and Paarl are definitely worth a visit, however, I’d have to say (and so would many others!) 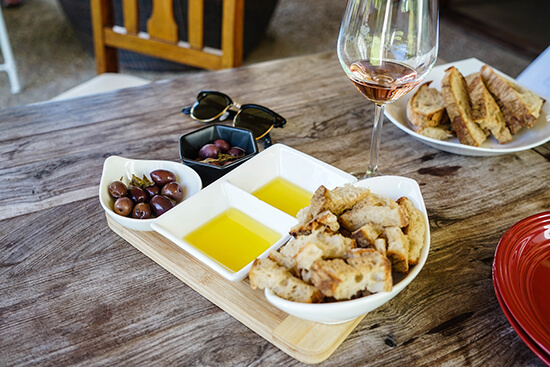 that the top pick within the province is Franschhoek – or as I came to know it: the ‘Food and Wine Capital of South Africa’. 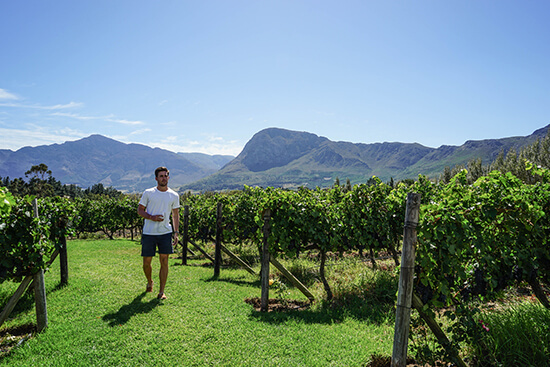 Franschhoek has vineyards galore, so much so that it soon becomes a test of willpower when it comes to stopping yourself and deciding whose turn it is to drive. That is, unless you take the Franschhoek Wine Tram of course. It sounds too good to be true, and it is. Almost. 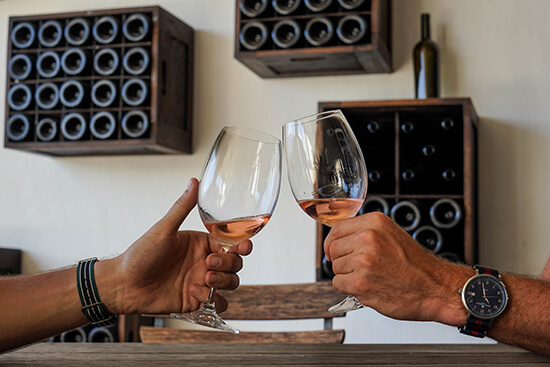 On a recent trip to the Western Cape, I travelled with two friends (John and Travis) and we decided that, rather than arguing over who was driving, we’d test out this revamped Franschhoek fad. In total there are four tram lines to choose from (red, green, yellow or blue), each of which will take you to varying combinations of well-known and smaller family-owned wineries. Where you hop-on or hop-off is up to you. We opted for the blue line, starting at a very amicable (but slightly too early for alcohol) time of 10.30am. The first mode of transport isn’t actually a tram, but more of a tram-bus hybrid. It definitely looked the part, complete with toe-curlingly cringing music onboard. A few glasses in though, and I found myself just embracing it. As the tram tour continued, we were shimmied onto a newly-constructed tram (modelled after the trams of the 1890s), and that’s when the music really kicked up a gear: I’m talking an odd acoustic version of Shakira’s ‘This Time for Africa’. I promise I’m not making this up. Our first proper stop was the Holden Manz Wine Estate, nestled in the corner of the Franschhoek Wine Valley. Stunning views, and great rosé (even if it was only 11am), but just a little bit modern for my liking. We then zipped through numerous other well-known wineries like Grande Provence and Mont Rochelle – all of which were undoubtedly impressive. Their world-class wines and award-winning restaurants, coupled with their white-washed grand entrances, made them very enticing; however, my favourite stop had to be La Bourgogne, a small family-run estate. The entrance to La Bourgogne feels like a slightly overgrown garden. I know it doesn’t exactly inviting, but its unruliness is definitely part of the charm, so don’t let it put you off. A small gravel pathway leads you to the farmhouse “stoop” (verandah), where the wine-tasting takes place. Even during midday, you’re shaded by centuries-old oaks, so if there’s no space on the stoop, there are plenty of shaded picnic benches and verdant lawn spots to relax on. All very idyllic. We arrived at lunchtime, and couldn’t resist the offerings of farmhouse food. 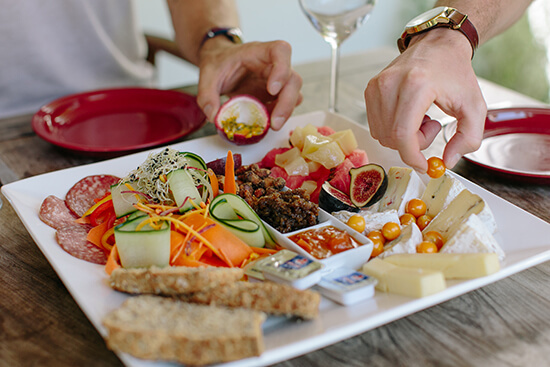 La Bourgogne grows its own olives and fruit, and it even produces its own cheese, so it would’ve been rude to turn down the homegrown-homemade food platter. Paired with the wine and the charismatic setting, this was hands-down the highlight of an incredible day. As cheesy (pardon the pun) as it sounds, the tram is a pretty sensible choice if you want to sample the best tipples this beloved wine region has to offer. Just be sure to pack your wine googles, some cash and a sense of humour. 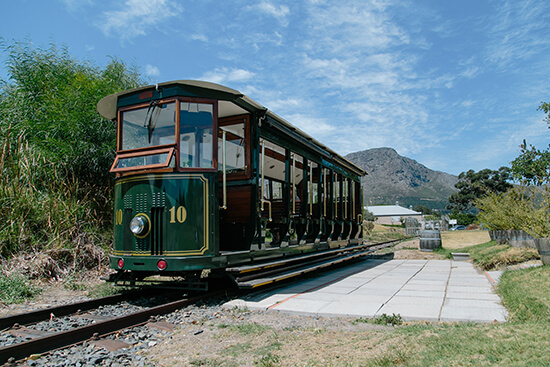 Speak to one of our Travel Experts about tailor making your South Africa holiday to incorporate the Franschhoek Wine Tram.